Goals: Design a novel way to recommend interesting places for visiting in the touristic city based on the feedback from social media. Solution: Web application for exploring trending themes of city locations and finding a set of places to visit for each theme. 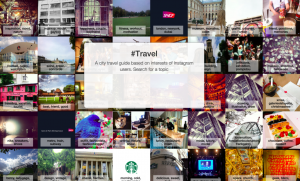 The locations are extracted from the geo-localized photos of Instagram; and their themes are detected by topics of the associated hashtags. People often have a subject, a taste, a style or an interest that guides them to visit places they like. Nevertheless, traditional online travel guides are giving recommendations rather based on the categories of the places and their rankings. In this project, we suggest to use user-generated content to aggregate additional information about locations. Using geo-localized photos from Instagram and their associated hashtags, we develop a system that: a) Automatically clusters a set of instagrams with respect to existent city locations, b) Extracts the trending topics in the hashtags associated with the photos, and c) Generates sets of diverse locations that share the same topic. As topics are extracted directly from the user-generated content, they are more dynamic than predefined category- or tag-based descriptions of locations and reflect user interests and context of visiting those places. The example topics we were able to extract are “Christmas,Christmastree” and “design,vintage,deco”. Finally, we design a web application where users can browse the various topics and their corresponding locations in order to discover locations that suit their taste, style, or interest.